Definitely a crowd pleaser, the Season's Bounty is a classic fruit basket prepared by experienced local florists for a one-of-a-kind gift. With each basket its own unique creation, fruit selections may include apples, grapes, pears, bananas, or other fruits. Photo shown is an example only. Specific basket, ribbon, and fruits included will change based on local availability and florist choice. if ordered by 2:00 pm EDT Saturday April 20th. Season's Bounty is a hand delivered gift. These gifts are delivered by one of our local design centers located throughout the United States and Canada. Same day delivery is available for most gifts when ordered before the cutoff time. The cutoff time for Season's Bounty is 11 AM in the recipient's time zone. This was a birthday gift for a very dear friend....He was very excited and so was his family. He lives in Manhattan, Kansas....all of his life. Thank you so very much for your help in getting this beautiful fruit basket to him. His wife, daughter and grandkids are all enjoying the fruit. The recipient of the gift loved it and was very happy that the fruits were fresh. Sent "Season's Bounty" to our brother and his wife in California. They LOVED it! Turned out the arrangement came from his favorite store for fresh fruit! They were truly impressed. Biggest and best tasting grapes they've ever had! They were pleased -- and we were pleased, too! Will definitely order again! The person this was sent to said it was very nice gift. Liked all the different items of fruit in the basket. The recipient of my gift sent me several photos and it looked lovely, although for the price, I think it certainly should be! I know that she was very pleased and thought the fruit was tasty. I have sent a similar selection for five years now, to honor an anniversary, and each year the response from the recipient has been positive. Dependable. The fruit is always great and the service is wonderful. The recipient said it was a beautiful basket, very full and everything of good quality. This is good to know for future gifts. Thank you! This was way more than expected, beautiful basket. And everyone in the family was able to take something from it. I would purchase this again! Let me add, the customer service not only called me, because I forgot to sign the card, they also contacted the recipient to make sure they would be there for delivery. Also delivered ON TIME! Thank you, excellent service. The best they ever got! Thank you! I sent this basket to the desk staff at my daughter's doctors' office. The basket was full of beautiful fruit, and the young ladies were all so appreciative of the gift. 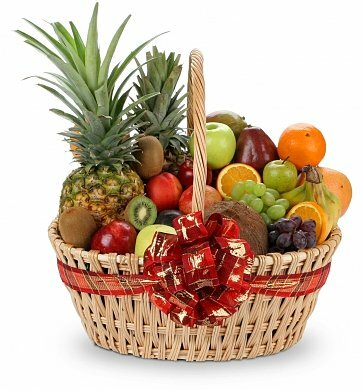 According to the recipient of this gift, the basket was full of a wide variety of fruits that were perfectly ripe and thoroughly enjoyable. My friends were very happy to get this gift; they said it was beautifully arranged and the fruit was fresh and tasty. Ordered this as an appreciation gift. After receiving the basket, the recipients called and said, "All I can say is WOW!" They said the basket was big and beautifully presented and the fruit was delicious! GiftTree won't let you down!!! GiftTree you are wonderful! Thank you so much for being pro-active with delivering to my dad who was unexpectedly rushed to the hospital in Florida while on a brief vacation. When GiftTree found out that my dad was in a room that did not accept deliveries (ICU), they attempted every to make the delivery until he was in a room that accepted deliveries. GiftTree called me and gave me an update daily. He received the delivery and was very pleased! Thank you very much GiftTree!!! I just can't thank you enough! I ordered this basket for Mother's Day. My mom's first comment was "it's huge." She loved the variety of fruit and the presentation was beautiful. I spoke with the recipient of this basket several days after we had sent it. He said he had gotten several baskets but ours was by far the best one he received! We will be making GiftTree.Com our place to come for all of our Corporate gift basket needs. Thank you GiftTree for a super job on your basket!! I did not see the basket personally, but my giftee sent me a picture and a beautiful smile that said how pleased she was with the basket. The picture she sent was every bit as beautiful as the picture here on this page. I consider GiftTree.com to be a great find!!! Don't waste your time and money elsewhere, just use GiftTree ! My husband and I were in different countries on our anniversary, due to my job. So I ordered this basket as a last minute reminder of how important the date is, and how much I love him! The basket was perfect, even better than the picture shows and arrived just a few hours after I ordered it! My husband said that all the fruits were chosen very carefully, and were delicious! Most important of all is that he was truly happy, and it helped us to deal with the 4 thousand miles distance! Sent as a gift. Received very positive comments from the receiver. Said the basket was beautiful, full of fruit and each piece was delicious and very sweet. He described it in one word: Fantastic! I was worried that the receiver would not take so well to this gift, giving that it is just fruit, but it certainly delivered. It was very well presented, the fruit was fresh, as described and above all, delivered the next day. It's also nice that those from overseas can purchase these gifts to send to those in the U.S. I would definitely use GiftTree again. The receipient truly enjoyed the fruit basket and thought it was absolutely beautiful. It really made her day and also made her feel a little better. Thanks Gift Tree for putting a smile on her face. Keep up the good good work.